The SKInny: Wolfeboro Rec Department offers novice and intermediate skiing with a 1 rope tow. Like most “town tows” it has a main slope, plus a couple of trails through the woods for more challenging snow. The main slope is groomed regularly. Good fun! Link goes to the town Rec Dept website, not usually much there specific to the ski area. Arrowhead, Claremont • 5-20 skiable acres on 127′ lift served vertical. Specs: Summit Elevation: 1022′; Base Elevation: 593′. 3 Surface Lifts: 1 pony tow, 2 poma lifts. Terrain Mix: 40-40-20. Longest Run: 3,000′ (not lift served). The SKInny: A re-opened hill that does a pretty fine job; skiers expecting a run-of-the-mill local tow will be pleasantly surprised to find that this is a bonafide throwback ski area. Now, what does that mean? Well, it’s like a lot of ski areas from the 1960s and 70s that are long gone…too small to compete with the big hills, not really enough snow, too little money, not enough skiers willing to go. To us it means short or no lines, uncrowded slopes, and trails that are neither overgroomed nor have moguls the size of a compact car. The upper portion of Arrowhead, once served by a lift, is sort of open as hike-to terrain and is considered unpatrolled backcountry. So for those willing to hoof it — and talented enough to ski it — a wonderful 430′ vertical awaits. Attitash/Bear Peak, Bartlett • 280 skiable acres on 1,511′ vertical. Specs: Summit Elevation: 2,350′; Base Elevation: 600′. 12 Lifts: 3 quads, 3 triples, 3 doubles, 3 surface. Uphill Capacity: 14,385/hr. Terrain Mix: 20-47-33. Longest Run: 10,560′. Season: usually mid/late November through April. Annual Snowfall: 142″. Snowmaking: 97%. The SKInny: Attitash, and the newer Bear Peak, is one of four New Hampshire ski areas that is most similar to a Vermont condo-covered/resort megaplex type operation. Yes, you can ski alongside condos, but you have to hunt for it, and the contact is so brief that it just adds to the enjoyment. 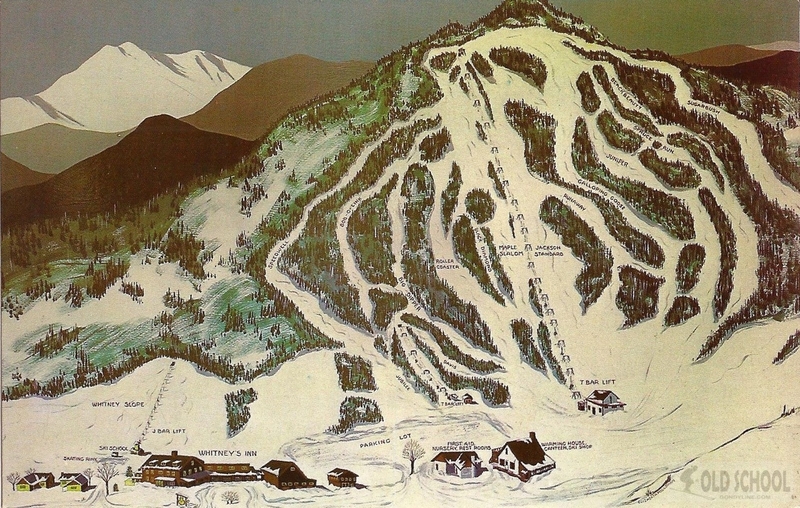 The original Attitash Mountain is a well-laid out ski area built prior to the days of designing with dynamite. Today, the mountains at Attitash/Bear Peak present a number of different faces and fall lines; the wanderer and hotshot will both enjoy the day, as will families looking for more leisurely skiing. Be warned that the runs from the summits are not for beginners. Unfortunately, most novices aren’t deterred, and the turnpikes from the summits are frequently scraped clean by 11:00 am on weekends. Skiers then move to Bear Peak, which is often prone to ice anyway. A better strategy is to park and start at Bear Peak, then move to Attitash late morning. Early morning at Attitash can be brutal — it faces north and is dark and cold. Once the snow is scraped off, move around, you’ll find something skiable somewhere. Comparing the two peaks, Ski trails are more interesting at Attitash; lifts are newer and faster at Bear Peak. Some of trails at Attitash see very little sunshine during the dead of winter. Plenty of steep, as well as groomed cruisers…an all-around great ski area that seldom has long lines. In fact, the lines at the ticket windows are frequently longer than the liftlines. For trivia buffs, Attitash is one of the few ski areas where one chairlift (Attitash triple) crosses over another chairlift (Attitash quad). Despite the ice and occasional crowds, Attitash is a must-ski. Recently purchased by Peak Resorts, Attitash is slowly but surely reclaiming its position as one of New Hampshire’s top ski areas. Update for 2018-19, the old double chair (shown in the photo below) was removed. Sniffle. Signature Trails: Upper & Middle Ptarmigan, Tim’s Trauma, Idiot’s Option. The Balsams, Dixville Notch • 88 skiable acres on 1,006′ vertical. Specs: Summit elevation: 2760′; Base elevation: 1,754′. 6 Lifts: 2 triples, 1 double, 2 t-bars, 1 surface. Uphill Capacity: 2,250/hr. Terrain Mix: 25-50-25. Longest Run: 8,000′. Season: usually mid December through April. Annual Snowfall: 225″. Snowmaking: 80%. The SKInny: The full name is Balsams Wilderness, and with good reason. It’s the northernmost skiing in New Hampshire, in the middle of the great north woods. If not for the impressive 1,000′ vert, it might seem that skiing is a diversion here, decent enough, but more like a sideline offered at a world class hotel…which is exactly what it is. It just happens to be a luxury hotel with a surprisingly good ski area. For 2011-2012 the resort has been sold and is supposedly being refurbished — as a result, the ski area is closed until further notice. 2014 Update, snowmaking permits have been applied for. 2018-19 Update, development seems to have hit a logjam, future outlook is not very good. Black Mountain, Jackson • 143 skiable acres on 1,100′ vertical. Specs: Summit Elevation: 3303′; Base Elevation: 1250′. 4 Lifts: 1 triple, 1 double, 1 j-bar, 1 platter pull. Uphill Capacity: 3,700/hr. Terrain Mix: 33-34-33. Longest Run: 8,000′. Season: usually mid December through April. Annual Snowfall: 120″. Snowmaking: 98%. The SKInny: Black Mountain calls itself “A New England Classic,” and rightly so. Ever wonder why 99 mountains out of 100 have a dopey trail called “The Thruway” or “The Turnpike” or some similarly-named avenue that cuts across the face of the mountain — including most of the expert trails — and presents a steady roadblock of cross traffic? Black Mountain has virtually none of this. If you’ve only skied at modern resorts with wide trails, fences, terrain parks and detachable quads, be warned that Black will change your entire perspective on ski areas. Narrow chutes open into broad meadows. Wide groomers branch into a number of narrow options. Drop off a headwall, skirt into a gorge, around some glades, and out into a field. Find yourself wondering, “how did I end up over here?” You can ski with map in hand all day, then suddenly find yourself on a trail you’d overlooked. It’s glorious. Lifts are slow, but liftlines are non-existent — you’ll make run after run after run. Lift tickets are cheap. Afternoon tickets are even cheaper. The place is usually empty, and the skiing is outstanding. Black Mountain will ruin a lot of other ski areas for you. Stuck in the shadow of Attitash, Cranmore, and Wildcat, Black is overlooked by the crowds. Snowboarders are few and far between. Teenagers and hotshots will hate this place, but intermediates and advanced skiers will love it. Wanderers will call it “small,” but be thoroughly pleased by its variety and quirkiness. Families can’t find a better ski area. For trivia buffs, Black is one of the few remaining ski areas where a chairlift passes over a platter-pull lift. It’s also one of the few places where fencing is minimal, and you can still see beginners unintentionally crash right into the parking lot. Most won’t call Black the best ski area they ever visited, but a lot of people call it their favorite. Note that if you buy your ticket after 2:00 pm, you are officially buying a ticket for tomorrow…so you can return free. Recommend. Signature Trail: Maple Slalom, Jackson Standard. If you would like to visit our unofficial, in-depth Black Mountain Page, please click here. Includes trail-by-trail analysis, has free Black Mountain wallpapers to download, and explains how to find the third floor in the lodge. Bretton Woods, Twin Mountain • 375 skiable acres on 1,500′ vertical. Specs: Summit Elevation: 3,100′; Base Elevation: 1,600′. 8 Lifts: 4 quads, 1 triple, 1 double, 2 surface lifts. Uphill Capacity: 14,385/hr. Terrain Mix: 29-39-32. Longest Run: 10,560′. Season: targets November 8th through April. Friday and Saturday skiing until 10:00 pm. Annual Snowfall: 200″. Snowmaking: 95%. The SKInny: Bretton Woods is the chic destination of New Hampshire skiing, mainly because of its roots in, affiliation with, and proximity to the ultra-ultra Mt. Washington Hotel. But this is New Hampshire, remember, where the land is hewn from granite and the skiing is, uh, cold. That, and the fact that Bretton Woods is the closest skiing to the discount lodging strip known as Twin Mountain combine to keep things real. Cannon it’s not; Bretton Woods is groomed, groomed, groomed. It’s civilized, family skiing. Ongoing expansion have made it a great spot for wanderers, although hotshots might find things a bit humdrum. Novices through low-end expert (which is most of us) will find plenty here. Most of Bretton Woods is like a giant, snow-covered cookie sheet tipped up ever so slightly. Ride the chair from the base lodge and you’ll wonder if there’s any pitch at all. There is; you just have to find it. Move up high, away from the base chairs. Various glades and tree runs are hidden here and there. And there’s some nasty. Not much, but it’s there, and it’s nasty. Trails like Stinger on the main mountain. Move to West Mountain, and you’ll find some of the most pleasurable gladed runs anywhere. Runs like Wild West are open enough and flat enough that even a middling intermediate can handle the trees. If you ski Bretton Woods on a weekend, be prepared for crowds at the base lifts. Use the base lifts to access higher lifts, and stick with those. A little secret: When the base quads are jammed, use the old “B” lift double. Although the trail maps don’t show it, this old ride allows you to reach one of the higher chairs if you keep right off the chair then go hard to skier’s left. Bretton Woods is pricey, but delivers quite a bit for the buck. Interesting thing, the beginner area-only ticket is deeply discounted, and that’s nice. Campton Mountain, Waterville Valley • 12 skiable acres on 310′ vertical. Specs: 2 lifts: 1 double chair, 1 rope tow. Night skiing. No snowmaking. The SKInny: Here’s the feel-good story of the decade; a tiny lost ski area re-opens thanks to the dedicated efforts of Waterville Estates, the condo/ski house community in which this is located. Although quasi-private, it is open to the public. Let’s be clear, this is no Waterville Valley, but it is a nice, laid-back alternative to the madhouse that can be found up the road on busy weekends. Keep in mind there is no snowmaking, so it’s best to check ahead to see if it’s open. When it is, enjoy the natural snow…it’s fantastic. Small, but fantastic. Cannon, Franconia Notch • 285+ skiable acres on 2,146′ vertical. Specs: Summit Elevation: 4,186′; Base Elevation: 2,146′. 9 Lifts: 1 Tram, 3 quads, 3 triple, 1 pony, 1 magic carpet. Uphill Capacity: 11,000/hr. Terrain Mix: 14-46-40. Longest Run: 12,144′. Season: Mid-November through early April. Annual Snowfall: 150″. Snowmaking: 97%. The SKInny: This is it, baby, the real deal. Hot drops, hotshots, bumps, the tram, rocks, ice, and a marvelous lake approach on the descent. The wind blows through the Notch like an arctic hammer. Send your hack cousin and Escalade friends to Bretton Woods; head to Cannon when you’re ready to bang down some serious New England trails with some serious skiers. Although intermediates can find plenty to do, Cannon is still not really for the beginner. The Brookside Area, with its alternative limited area ticket, has been expanded. It’s now a lot larger than it was, a quad chair has been added and the Brookside-only ticket is a bargain. So for the novice not looking to ski the entire mountain, it’s a fantastic deal. 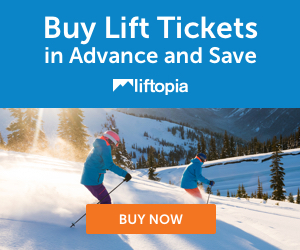 Liftopia often has discount tix for Cannon; if you know a specific day that you plan to go, click here for our link. A tiny portion of the proceeds support this website, at no added cost to you. The Skiing: Wanderers will look at the skiable acreage and dismiss Cannon, but its variety of lifts and faces will give them plenty to do. Hotshots will feel at home. For years, the adventurous ventured onto the shuttered slopes of Mittersill but now the deal is done, Mittersill is reopened with its own chair and fully part of Cannon. This is a big, important ski area. Signature Trail: The Front Five, also Taft Slalom to Mittersill. Cranmore Mountain Resort, North Conway • 192 skiable acres on 1,200′ vertical. Specs: Summit Elevation: 1,700′; Base Elevation: 500′. 10 Lifts: 2 quads, 2 triples, 1 double, 2 surface lifts. Uphill Capacity: 7,500/hr. Terrain Mix: 36-44-20. Longest Run: 5,280′. Season: Mid-November through early April. Night skiing on Fridays, Saturdays, and Holidays. Annual Snowfall: 120″. Snowmaking: 100%. The SKInny: In old school skiing circles, Cranmore is best known for something that doesn’t exist any more: The skimobile. That sentimental lift is long gone, yet Cranmore is still the most “elegant” New England ski resort. Old and storied, yet the equipment and attitude is today. It’s located right in town, so it feels developed, yet is somehow comfortable at the same time. More serious skiers will head to Wildcat, but a day at Cranmore now and then is a good thing…it’s nice to be able to stay awake after a long day of skiing; Cranmore is tame enough to permit that, with only a handful of really taxing trails. A nice all-around day…Bostonians who leave at lunchtime can enjoy a full evening on Fridays. The novice trails can get crowded. Liftlines can get crowded; weekends and holidays bring long lines. Holiday weekends can be a disaster in terms of lines. But hey, it’s Cranmore. Couple of things to note: Weekdays are an absolute dream. Night skiing is a flat-out bargain, and it’s never crowded. The locker areas, restrooms, and dining facilities are very clean. Also, if you buy a full-price ticket, you can ski the second day at a discounted rate. Signature Trail: The Ledges, North Slope. Crotched Mountain Ski & Ride Area, Bennington • 60 skiable acres on 875′ vertical. Specs: Summit Elevation: 2066′; Base Elevation: 1050′. 5 Lifts: 2 quads, 1 triple, 1 double, 1 magic carpet. Uphill Capacity: 11,200/hr. Terrain Mix: 28-50-22. Longest Run: 4,000′. Season: Mid-December through March or April. Night skiing Mon-Sat., 3 am skiing Fri-Sat in January. Annual Snowfall: 70″. Snowmaking: 100%. The SKInny: Crotched is a big small ski area that provides an alternative to Pat’s Peak and Wachusett (MA). Was a “lost” ski area for many years, reopened during 2003. Day skiers from Providence RI, Worcester and Boston are finding Crotched to be a much less crowded alternative to some of the others. They’re also finding that it caters to snowboarders, and some of the area has a decidedly un-New England feel to it. That’s not necessarily bad; trails have been widened, equipment is sparkling new, ticket plans are somewhat different from nearby areas. Another aspect that looks out of place is the snowmaking system. It’s massive, it’s state-of-the-art, and its permanent tower-mounted fans are more reminiscent of a midwestern ski area. It also gives Crotched a lot of open terrain when larger areas are still cutting hay. This was Peak Resorts first venture into New England; they operate a number of ski/snowboard hills in Ohio, Missouri, etc. notably Brandywine near Cleveland, and since reopening Crotched, Peak has taken over Attitash and Vermont’s Mount Sneaux. Over the past few years Crotched has arguably evolved into the best ski area in Southern New Hampshire. It’s a prime destination for school trips, church youth group trips, etc. The more serious Boston day trippers might be better off getting up an hour earlier and making the drive to Sunapee, Ragged, Gunstock, (assuming those have snow) etc., but in terms of distance and value, Crotched is tough to beat. It ain’t Cannon, but it also ain’t three hours up the highway. Good mix of terrain park stuff, groomed cruisers, even some “secret” stashes and hike-to terrain when conditions warrant. Signature Trail: Meteor, also Galaxy to Big Dipper. Dartmouth Skiway, Hanover • 104 skiable acres on 968′ vertical. Specs: Summit Elevation: 1,943′; Base Elevation: 975′. 3 Lifts: 1 quad, 1 double, 1 surface lift. Uphill Capacity: 3,300/hr. Terrain Mix: 25-50-25. Longest Run: 6,600′. Season: December through March/April. Annual Snowfall: 100″. Snowmaking: 54%. The SKInny: Dartmouth Skiway is Ivy League skiing, a weird blend of old money skiers and local hicks. The skiing isn’t spectacular by New Hampshire standards, but any day following a snowfall is, and its Connecticut River Valley location means it is warmer and less icy than its big brothers in the White Mountains. Dartmouth is two small ski areas in one; Winslow Mountain and Holt’s Ledge. The two areas are bisected by a county road. Winslow tends to open first — it’s the side with the parking lots, bulk of the snowmaking, and the beautiful new lodge. Wanderers will enjoy Dartmouth Skiway as much as any 1,000′ vertical can be enjoyed, while hotshots will be somewhat underwhelmed. Although to the Skiway’s credit, some of the terrain on Holt’s Ledge will give pause to all but the most accomplished skiers. Signature Trail: The Thomas Trail. MBA is a beautiful rolling trail through the woods, with all sorts of natural pitch variety. Granite Gorge, Keene • 25 skiable acres on 525′ vertical. Specs: 2 Lifts: 1 handle tow, 1 double chair. Terrain Mix: 35-35-30. Longest Run: 3,000′. Closed Mondays; night skiing Friday & Saturday. 25% snowmaking. The SKInny: A fairly good sized “local” ski hill, although GG tries hard to attract skiers from elsewhere, billing itself as a “gateway” ski area, etc. Outstanding local race programs, great value. Another of those smaller areas that is well deserving of support. Gunstock, Gilford • 220 skiable acres on 1,400′ vertical. Specs: Summit Elevation: 2300′; Base Elevation: 900′. 7 Lifts: 1 quad, 2 triples, 2 doubles, 3 surface lifts, 1 magic carpet. Uphill Capacity: /hr. Terrain Mix: 7-72-21. Longest Run: 13,200′. Season: usually December through April. Annual Snowfall: 100″. Snowmaking: 80%. The SKInny: Gunstock is a great ski area. Not as big as some, but bigger than the storied Cranmore and Black further north. The skiing is good, highlighted by spectacular views of Lakes Winnepesaukee and Squam. Novices will find this hill a little daunting…it’s one of the few that doesn’t offer a true green from the top. There’s history here; it’s a gotta-ski area. Kanc Recreation Area, Lincoln • 4 skiable acres on 221′ vertical. Specs: 1 rope tow, 750′ length. Longest Run: 1000′. Season: usually December through March, as conditions permit. Closed Fridays. Night Skiing Monday, Weds., Saturday. Special hours for holiday weeks. Annual Snowfall: 90″. No snowmaking. The SKInny: Here it is folks, one of your last remaining opportunities to ski an old fashioned town tow. Run by the Lincoln Recreation Department, this is about as good as it gets. Nice slopes, free skating and sledding next door. Day rate was $10 for non-residents in 2005. Make no mistake, there is some serious skiing done here. Now, here’s something you don’t see everyday: The Rec Department receives a bunch of donated ski gear. Local kids are encouraged to borrow the stuff, then return it when they outgrow it. You can’t do better than that. When you book your vacation at Loon, make sure you set aside a day to buy a ticket and make a few turns at the Kanc Recreation Area. Link above goes to the Rec Dept; click on the newsletter files for up-to-date info. King Pine, East Madison • 50 skiable acres on 350′ vertical. Specs: Summit Elevation: 850′; Base Elevation: 350′. 6 Lifts: 3 triples, 3 surface lifts. Uphill Capacity: 3600/hr. Terrain Mix: 50-30-20. Longest Run: 3960′. Season: usually December through March. Night Skiing: Tuesdays, Fridays, Saturdays & Holidays. Annual Snowfall: 120″. Snowmaking: 100%. The SKInny: This is a family type resort operation, part of nearby Purity Spring Resort. Couple of things to note: It’s not the smallest ski area in New Hampshire, but it’s close. Conversely, it doesn’t have the steepest trail in New Hampshire, but close to it. (!) Despite the one nasty pitch, wanderers, hotshots, or any veteran skier will be underwhelmed at King Pine. But it is THE place to take the true beginner…kids, the never-skied before girlfriend, etc. And it provides a great family skiing experience; King Pine offers an optional ticket that is valid for downhill, XC, and ice skating. Lisbon Ski Tow, Lisbon • 5 skiable acres on 50-100′ vertical. The SKInny: Town type ski tow, supported by the local Lions Club, etc. Sporadic operation. Loon, Lincoln • 275+ skiable acres on 2,100′ vertical. Specs: Summit Elevation: 3050′; Base Elevation: 950′. 10 Lifts: 1 gondie, 1 quad, 2 triples, 3 doubles, 3 surface lifts. Uphill Capacity: 10,550/hr. Terrain Mix: 20-64-16. Longest Run: 13,200′. Season: usually November through April. Annual Snowfall: 121″. Snowmaking: 99%. 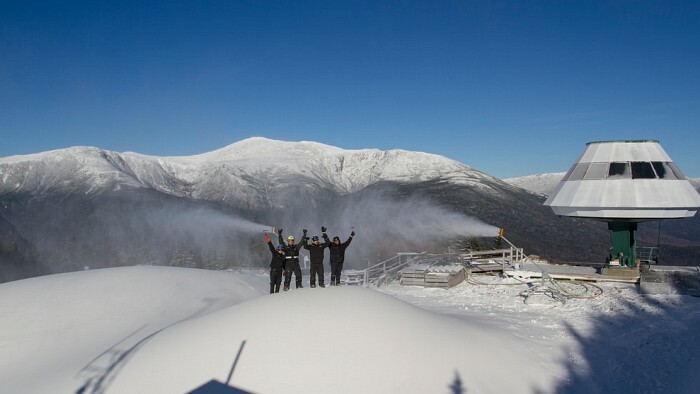 The SKInny: For the last couple years Loon has launched into the stratosphere of snowmaking power, opening more terrain sooner than any resort in NH — including Bretton Woods. Loon is ever popular with families. It’s New Hampshire’s resortish ski area, close to Boston and with all the requisite condos, timeshares, shopping and summer golf courses. The skiing has something for everyone…plenty of gentle trails for families, and it does provide a few thrills for experts. Wanderers will find plenty of slopes and lifts to explore, while the hotshot will enjoy strutting for the crowds. Loon expanded in 2008 to a new section west of the existing area. The new didn’t open with much, but it is adding terrain as time goes on. This is a big, well-liked ski area. Sometimes you find yourself on a long line, but if you move around you can avoid that. Word here for a terrific adaptive program…kudos to the mountain and the volunteers. Great destination ski resort. McIntyre Ski Area, Manchester • Approximately 12 skiable acres on 169′ vertical. Specs: 3 Lifts: 2 doubles, 1 surface lift. Uphill Capacity: 2,000/hr. Terrain Mix: 50-50-0. Longest Run: 1,500′. Season: usually December – March. The SKInny: Thank goodness there are still a few in-town ski areas left. If you live in Manchester or environs, and you have kids under high school age, shame on you if you don’t buy them a season’s pass. Is your wife a giant boat anchor when you go on ski vacations because she won’t? Take her to McIntyre. Can you squeeze in a 2 hour lunch in January? You get the idea. Pat’s Peak, Henniker • 73 skiable acres on 710′ vertical. Specs: Summit Elevation: 1400′; Base Elevation: 690′. 9 Lifts: 2 triples, 3 doubles, 3 surface lifts, 1 carpet. Uphill Capacity: 6,800/hr. Terrain Mix: 38-48-14. Longest Run: 7,920′. Season: December – March. Annual Snowfall: 90″. Snowmaking: 95%. Night skiing M-F in January & February. The SKInny: You know, not every metropolitan area on the East Coast has 700′ of legitimate skiing within an hour’s drive. If only this mountain wasn’t so close to bigger stuff…still, the Manchester/Nashua/Boston area has enough skiers to support it, and I hope they continue to. Wanderers will enjoy it about as much as a small mountain can be enjoyed; Hotshots will be underwhelmed…both will prefer things a bit further north, but a day at Pat’s is still pretty darn decent. Excellent small mountain, skis bigger than it is. A good thing to have close to the population centers in southern New Hampshire. Ragged Mountain, • 200 skiable acres on 1,250′ vertical. Specs: Summit Elevation: 2250′; Base Elevation: 1000′. 9 Lifts: 1 siz-pack, 2 triples, 2 doubles, 4 surface lifts. Uphill Capacity: 4,420/hr. Terrain Mix: 33-40-30. Longest Run: 9,240′. Season: December – March. Annual Snowfall: 100″. Snowmaking: 98%. The SKInny: Ragged is a modern day Cinderella story. Saved from the brink of closing in the late 80s, the owners started with a ready-to-condemn base lodge and no functional lifts. Slowly and steadily, lifts were added, improvements were made, and Ragged has risen from the ashes. Today it is a significant ski area with two modern base lodges, state-of-the-art equipment, and some problems. Financing? Debt? We’re not sure, but the 2006-07 season nearly killed off this place. It’s on and off the auction block, we sure hope it survives. Note that Ragged is not exactly a destination resort. On the other hand, lift lines are short, lift tickets and food prices are reasonable. Both wanderers and hotshots can keep themselves occupied here; some folks even sneak into a couple small out-of-bounds areas. It’s one of those Southern New Hampshire oddities – big mountain skiing where you really don’t expact to find it. Red Hill Ski Club, Moultonborough • ±12 skiable acres on 180′ vertical; members only. Specs: 1 rope tow. Season: December – March. Annual Snowfall: 70″. Open when conditions permit and volunteers are available; day and night skiing. Private club — seasonal memberships available. The SKInny: Very cool club operation just west of town. You can’t roll in and buy a ticket; it’s members-only but those memberships are darn affordable. So affordable in fact, you could cheat by joining as a single member and it would be worth it even if you only spent a single day there. And that’s for out-of-towners — If you live anywhere near Moultonborough the membership is a no-brainer. Surprisingly pitchy main face but with additional intermediate runs and a novice loop as well. When conditions permit, some enjoyable — albeit short — tree skiing awaits. Totally run by volunteers. Sunapee, Sunapee • 230 skiable acres on 1,510′ vertical. Specs: Summit Elevation: 2743′; Base Elevation: 1230′. 10 Lifts: 1 quad, 2 triples, 1 double, 4 surface lifts. Uphill Capacity: 8,550/hr. Terrain Mix: 26-49-25. Longest Run: 10,560′. Season: usually November through April. Annual Snowfall: 100″. Snowmaking: 97%. The SKInny: Sunapee is one of the state areas. It’s the runt, with the least amount of natural snow, lowest summit, shortest vertical…but it’s far from being an ugly duckling. Sunapee covers a face here, wraps around there, has a lift over there…it doesn’t just “feel” like a nice big ski area, it is a nice big ski area. Here’s a little secret: Sunapee has more “Vermontish” skiing conditions than the other state ski areas, because it’s geographically got more in common with the likes of Okemo and Killington than it does with the White Mountains. Right now it’s being run by the Okemo people in fact, and they’re doing a nice job. Tenney Mountain, Plymouth • 110 skiable acres on 1,400′ vertical. Specs: Summit Elevation: 2149′; Base Elevation: 479′. 4 Lifts: 1 triple, 1 double, 2 surface lifts. Uphill Capacity: 3,180/hr. Terrain Mix: 13-56-31. Longest Run: 9,240′. Season: Early October – April. Annual Snowfall: 140″. Snowmaking: 83%. The SKInny: Be aware that Tenney lists only 13% novice terrain, but don’t let that fool you. This really is an ideal place for novice/intermediate skiers. The black diamonds are thus because of some very steep — but very short — sections. Where Tenney wins is when the natural snow falls hard and all trails are open. Unfortunately this doesn’t happen often enough, but when it does, Tenney should be very, very high on your list of places to ski. Trails twist in and out, connect here and there, roll up and down, narrow and wide. It’s old-time New Hampshire skiing, except that it’s groomed very well. No high speed chairs here, but the fixed grips move along nicely. Uncrowded, unpretentious, excellent. The only skier who won’t feel at home here is the flat-out expert looking for steeps and bumps, or the hotshot looking for crowds. For the rest of us, Tenney is fantastic — as long as the snow falls. In terms of operations, sometimes this mountain isn’t open; call before you go. UPDATE: Tenney has reopened, although not 100%, and not 100% of the time. Worth supporting if you can. Tuckerman Ravine, Pinkham Notch The SKInny: Hike-in, backcountry skiing, not lift assisted. Potentially hazardous. Here’s a link to an interactive trail map on PowderHound.org. The SKInny: T-bar with a main slope and smaller “expert” trail, with some off-piste stuff. Operated by the rec department. Waterville Valley • 255 skiable acres on 2,020′ vertical. Specs: Summit Elevation: 4,004′; Base Elevation: 1,984′. 11 Lifts: 2 quads, 2 triples, 3 doubles, 4 surface lifts. Uphill Capacity: 15,631/hr. Terrain Mix: 20-60-15. Longest Run: 15,840′. Season: November 22 – Mid April. Annual Snowfall: 148″. Snowmaking: 100%. The SKInny: Most ski areas with 255 skiable acres spread out across a mountain or two, or three. Waterville Valley just goes up, and up, and up. Unfortunately the upper part of the mountain, High Country, is frequently not open. High Country is served by separate lifts. Usually, when the very top of a mountain is set apart this way, it’s exclusively black diamonds. At Waterville, the very top is exclusively blues. Indeed, Waterville Valley is an intermediate skier’s world. The Sunnyside area caters to experts, and gives hotshots the opportunity to show off (or throw a yard sale) right below the Sunnyside chair. Because it is the closest “big” ski area to Boston, WV can get crowded. It can also get icy. Built in the mid 1960s by legendary Tom Corcoran, WV opened with John Glenn, Andy Williams and Robert F. Kennedy hitting the slopes. Few people think of WV as their favorite, but I don’t know any who would pass up an opportunity to ski it. Note: Don’t speed driving into the Valley off I-93, and whatever you do, don’t drink and drive when you leave. Good destination resort. Signature Trail: True Grit (Expert) also Bobby’s Run. Whaleback, Enfield • 85 skiable acres on 700′ vertical. Specs: Summit Elevation: 1800′; Base Elevation: 1000′. 4 Lifts: 1 chair, 3 surface. Terrain Mix: 28-39-33. Longest Run: 5280′. Season: Dec-Apr. Annual Snowfall: 110″. Snowmaking: 80%. The SKInny: Here’s a ski area trying to come back from the dead. Olympic champ Evan Dybvig (not sure I spelled that right) took over the place about ten years ago and proceeded to lose a fortune. Now it’s operated as a non-profit, we need to go out and support this excellent ski area before it goes away again. It really is an excellent value, and a worthy (although smaller) alternative to Sunapee. 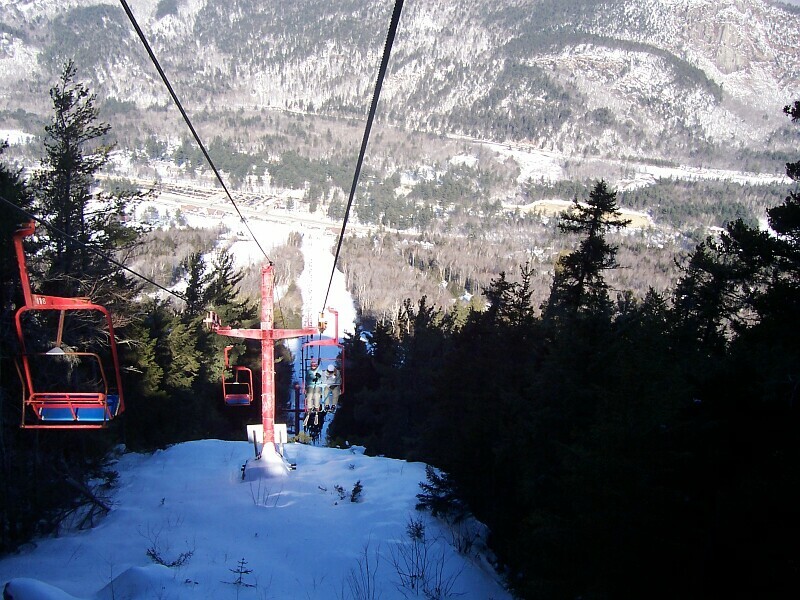 Wildcat, Pinkham Notch • 225 skiable acres on 2,112′ vertical. Specs: Summit Elevation: 4,062′; Base Elevation: 1,950′. 4 Lifts: 1 quad, 3 triples. Uphill Capacity: 6,700/hr. Terrain Mix: 25-45-30. Longest Run: 14,520′. Season: November – late April, sometimes May. Wildcat took honors for first to open in the east for the 2005-2006 season. Annual Snowfall: 250″. Snowmaking: 90%. The SKInny: The Cat is pretty much an old-fashioned, no-frills ski area; fancy outfits not required. Wildcat has a reputation for the best skiing, the best views, the best atmosphere in New England. It’s probably true. The skiing is phenomenal if cold. The views of the Presidential Range are the best, period. The atmosphere is minimal cement-and-steel ski lodge. The trail ratings are “true,” novices won’t venture onto the diamonds at Wildcat, and will avoid the blues as well. December/January conditions are generally icy and cold, however, March and April are all Wildcat…no mushing through wet cement on the Cat. An old-line ski area, but with modern infrastructure: A high speed lift whisks you to the summit in a few short minutes, and side lifts cover 2/3 of the terrain otherwise. What a great ski area! Although the Cat doesn’t list more than a few dozen trails, it actually has numerous routes down the hill: you can move around easily, cross from side to side, etc. and constantly discover new and hidden routes that you weren’t aware of. A great ski area. It has one of the highest vertical drops served by a single lift ride in the northeast. Note that on Saturdays and holidays, the Cat can get skied-off by midday. Also, in December/January a couple of the trails are affected by flat light conditions. The ski school at Wildcat is thoroughly professional, one of the best in the business. From flat-out beginners to extremely skilled race training, Director Phil Ostroski runs a tight, customer-centric operation. Signature Trail: Polecat (easy/intermediate) is New England’s ultimate ski, see & enjoy trail. We also have to mention Middle Lynx (a high-end blue) which has a long established reputation for truly challenging skiing. But the Wildcat Trail is the original hike-up trail cut by the CCC, and the site of races dating back to the 1930s.